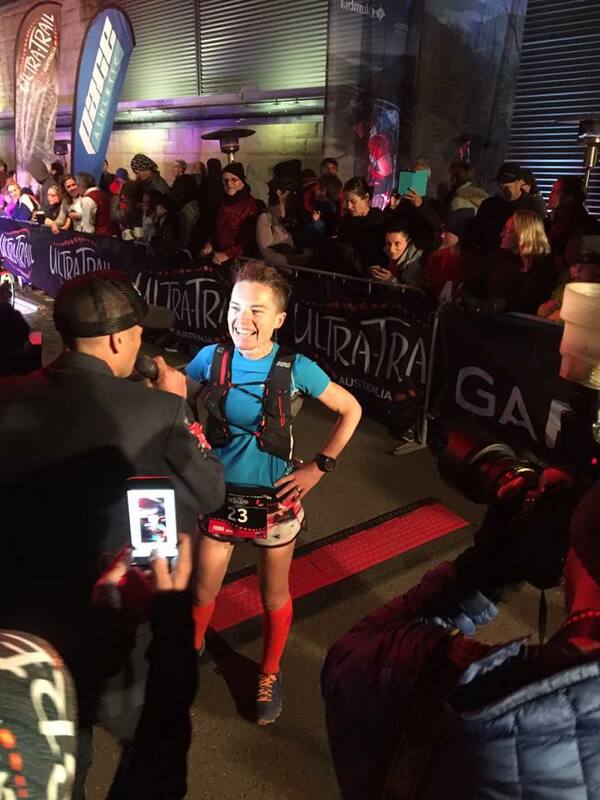 This is a comprehensive race report covering the Ultra-trail race Australia that Fiona Hayvice placed 2nd at with a time of 11hrs 33min 17sec. I'd decided to dig out my passport for the third time in my ultra running career. My debut endurance event had been on foreign shores; Racing the Planet's, Gobi March 2010 covering 250km over six-days. Despite the fact I'd approached the event rather naively, I'd returned home yearning for more. For the next few years I tackled a number of local trail events of varying lengths, and took a total break from running for 10 months whilst I carried and gave birth to our now 4 year old son. Then in April 2015, I travelled to Bright, VIC, Australia to run, scramble and slide my way over 75km of the Buffalo Stampede. No disrespect to the race organisers, but I was somewhat scarred by the brutality of the course. Consequently, as the date for what was to be my third international appearance drew nearer I started to question if I'd made a wise decision returning to Australia to race. I'd chosen Ultra-Trail Australia 100km (UTA100) due it's reasonably close proximity to home (Wellington, NZ), and the fact that it's on the Ultra-Trail World Tour (UTWT) circuit, my target for 2016. On the flight over from Wellington to Sydney I read through the comprehensive UTA course notes. I'd hoped to put my mind at ease, but alias I achieved quite the opposite. The meticulously detailed description (huge credit to whom ever wrote these, as the hours spent must have been mammoth!) made the imminent 100km traverse through the Blue Mountains, NSW, Australia seem even more daunting. Thankfully within a few hours of arriving in the Blue Mountains I'd gathered a totally different perspective on UTA. There is a lot to be said for seeing something with your own eyes. Gavin Markey, the Australian distributor of Tailwind Nutrition was my saving grace. I'd only started using Tailwind at the end of February (a direct result of struggling to keep on top of consuming solids in the later stages of the Tarawera Ultramarathon, 6 Feb 2016), yet already I was experiencing the genuine, all embracing virtues of this global family. Now's a good time to point out that unlike Buffalo, my immediate family (husband Todd and son Spike) had travelled with me to UTA, meaning I was blessed with experienced crew, and the often underrated, invaluable emotional support gained by having loved ones 'along-side'. We were all (support crew and athlete) equally grateful to Gavin, who willingly played UTA tour guide; driving us around the accessible sections of the course, providing insightful tips along the way, and being on-hand throughout the event. Almost instantly my mindset changed – there appeared to be a lot of wide, undulating, runnable sections (between an abundance of near vertical stairs! ), check point locations that my crew would have ample time to drive between, and proven race systems in place to enable as efficient gear checks and fluid/nutrition replenishment as possible - I was amped! 3.15am Saturday 14 May, my alarm sounded, I showered and started consuming breakfast – always three hours prior to the starting gun to allow enough time for digestion. The roads surrounding the start/finish-line at Scenic World, Katoomba were cordoned off to ease traffic congestion (with around 4000 entrants you could only imagine the chaos if everyone was to be dropped within a few hundred meters), and to provide the first few kilometers of the course. Hence, we parked our rental car in Katoomba town center, and caught one of the shuttle buses put on by the race. We'd been a little skeptical about relying on this service. However, we were very impressed by the efficiency, and would have no reservations using it in future years. The journey in the pitch black only enhanced my heightening anticipation. Arriving at the start-line, 5.45am (still dark), it was buzzing. Excited, somewhat nervous athletes, their devoted supporters, the largest contingent of paparazzi I've ever encountered, and an enthusiastic Race Director (RD) commentary, generated a party atmosphere! I gave Todd and Spike the biggest, most heartfelt embraces possible. In different ways all three of us had invested a lot of time and energy to get to this point. This is what we'd been building up to for months – realising that the moment was finally here, bought a tear to our eyes. Under the starting / finishing arch I tucked in behind some of the male favourites (Pau Capell (Spain, eventual winner), Jono O'Loughlin (Australia) and Scott Hawker (Kiwi, my Mile 27 coach, and 2nd place in 2015), shock hands with a few fellow Kiwis, and 2015 female winner Dong Li (China), then focused on the countdown, and before I knew it we were off. The first five or so kilometers is an out and back on tarseal. If it wasn't for the incline heading out, it would have been very easy to get carried away. Coming back, down the hill is a different story. Fresh legs from a week of tapering, the joy of finally being underway, and being conscious that I didn't want to get stuck behind anyone slow heading down the single-file, Furber Steps, resulted in an escalated pace. Running back past Scenic World, supporters lined the road, cheering loudly and ringing cow bells. This was the last we'd see of spectators for 46km, so I lapped it up. Equally I lapped up the increasing silence and solitude when finally we left the tarseal, descended Furber Steps, and submerged into the bush. Traversing the Federal Pass single track towards Golden Stairs was fast and fun. The female favourites were all within cooee of each other, made evident by Paul Charteris (RD, Tarawera Ultramarathon) and Jo Brischetto (Marketing Manager, UTA), chanting our names and taking snapshots for social media as we tackled our first major climb for the day – Golden Stairs. Not surprisingly, two renowned Australian 'mountain-goats', Beth Cardilli and Gill Fowler, almost bounced up the stairs, taking the lead positions with fellow Australian Kellie Emmerson. 11.4km into the race you reach the crest of a hill and nestled in the gum trees is Check Point 1 – Narrow Neck. I hadn't planned to utilise CP1 (the Tailwind I had mixed from the start would see me through to Check Point 2), so I didn't. Instead, keeping an eye on the leaders, I continued at a reasonable pace for the next 10km or so along, undulating, gravel fire trail. Not too far along Narrow Neck Plateau I passed Kellie, instigating an slight increase in pace. However, with coach's voice echoing in my head “run comfortable and relaxed, if you think you are going too fast then you are”, I was careful not to get too carried away. Perched high above Jamison Valley on the left and Megalong Valley on the right, the surrounding mountains were majestic, purple/blue in the soft early morning light. It was easy to see how they'd acquired their name. Climbing down the Tarros Ladders (sturdy aluminium ladders that are erected for race day to descend a 15m rock face), and navigating the subsequent steep, uneven decent, I was passed by Amy Lamprecht, and Kellie (the leading females leapfrogged quite a bit in the first 30 or so kilometers). It's never pleasurable being passed. However, I quickly reassured myself that although I'd fallen back into 5th place, on what I know is my weakest terrain, there was still an abundance of runnable and hikeable course to come – ample opportunity to make up time and placing. It was actually only a few kilometers later that the first opportunity did come along. Back on fire trail, I'd settled into a comfortable running rhythm and I caught up with Kellie again. She ducked off into the trees flicking me a 'knowing' grin, I smiled back, convinced that she'd be back on my tail again in no time. Instead, it was Dong that caught up with me next, once again I was passed on a descent. We exchanged simple greetings (English not being her first language, and me not having any command of Chinese dialect), I broke away on any climbs and she quickly rejoined / passed me on the downhills. We played 'leapfrog' all the way into Check Point 2 - Dunphy's Camp (31.6km). Entering CP2, Dong dashed into a portaloo, and I made a beeline to the water-taps, filling two of my soft-flasks as efficiently as possible. Screwing the tops back on carefully, to avoid spilling any of my precious Tailwind, proved a little trying with cold fingers. The sun was shining and we'd dropped considerably so I knew it probably wouldn't be long before I had the opposite challenge to contend with – sheltered valleys furnaced by the beating sun. Leaving CP2, I felt somewhat uplifted by my brief interaction with the volunteers. I 'skipped' (in my mind anyway) happily over open paddocks to the foot of Ironpot Mountain. Scaling up this somewhat rocky outcrop was definite hands-on-knees material. Popping up on top we were welcomed by the sound of the uniquely Australian didgeridoo. A short out and back, along large exposed rocks / cliff faces, prolonged this spine tingling encounter, and presented an opportunity to see exactly where I was in relation to the other females. As I headed out to the marshaled turn around point, Amy was heading back (I never saw Beth and Gill which meant I was sitting in 4th place). And as I departed Ironpot I acknowledged Dong (in 6th place), hot on my heels. Typically, as eluded to early, I'm a little cautious on steep descents. However, with the knowledge that Amy was not far ahead, and that Dong was close behind, I threw myself into the next drop – loose dirt underfoot, with a mix of hidden rocks and roots, and trees to dodge and/or use as stabilisers, this was probably the most hazardous part of the course. It was through this section that I started chatting to fellow Kiwi, Bernard Robinson. Like the majority of runners I spoke to during the day, he was a UTA returnee (testimony that this event is outstanding in every respect). At the bottom of this face we crossed a small creek, before making our way through undulating farmland; a combination of dirt tracks, grassy slopes and a few more creek crossings. From the farm house and yards it's then a rather laborious 6km climb up the mostly gravel (it changed to tarseal near the top) Melalong Valley Road, to Check-point 3 – Six Foot Track (46km). Nearing CP3, I was spurred on by the thought of seeing Todd and Spike for the first time, since starting approx. 41/2 hours earlier. Just shy of CP3, I spotted Gavin sheltering under a gum tree (by now it was late morning, the skies were clear and the temperature was rising). He shouted encouraging words, and indicated that there was a mandatory gear check prior to entering the replenishing zone. My name was ticked-off for carrying the compulsory head-lamp and waterproof jacket. I spotted Todd waving enthusiastically from the crew area. He called out that I was 7min behind the leader, and asked how I was feeling – my reply; “hot” and that although it wasn't planned “I'd fill one of my spare flasks” so I'd have some additional water through the next leg (500m elevation over 11.3km – potentially, a high sweat inducer!). The next few kilometers ticked away quite effortlessly as I made my way along dirt roads and single walking tracks, climbing gradually to the base of the infamous Nellies Glen. I was feeling strong heading up the valley, passing a few males as they hiked portions. Coming across a couple of local children, they gleefully called out “it's all downhill to Katoomba”. I suspected a longstanding, annual prank. Nellies Glen presented the second serious stair ascent of the day. On the profile map it looks shorter than Golden Stairs (back at the 10km mark), but I recall Nellies being a lot longer, a lot steeper, and there being considerably more cursing (perhaps it was just the fact I was now over 50km into the day). It was a relief to reach the top. Once again my smile emerged as I wove my way through bush, along narrow single track towards the outskirts of Katoomba. Glimpses of houses started to appear through the trees, Check-point 4 must be nearing. From walking track, to driveway, to tarseal – then into CP4 - Katoomba Aquatic Centre (57.3km). I'd never encountered running into a building to replenish my supplies before – it was quite a novelty. Previously, my experience with check-points/aid-stations had been temporary tables, sometimes with a gazebo, but never with roofing for competitors, and typically in semi remote locations. Thankfully Todd had positioned himself in the center of the crew zone, directly behind the rope barrier, so it only took me a split second to identify him in the sea of faces. I quickly exchanged two empty flasks for two pre-filled ones. Then, being in a tad too much of a hurry to be on my way, I almost departed through the wrong door. Todd quickly called out to correct me. Having successfully excited CP4 (10mins behind the leader), there were then a couple of hundred meters of footpath, before I entered a grassy reserve that linked residential properties through to the Katoomba cliff top walking trails. The ground was rutted and camouflaged by long grass. Hence, a significant amount of concentration was required to navigate the clearly, infrequently used track. All of a sudden I heard a familiar voice behind me; fellow Kiwi Doug Moore (attempting his first 100km). He'd been ahead of me up to CP4. However, feeling a bit off, he'd decided to take a short break at CP4 to regroup. This appeared to be a wise decision, as by the time we reached the Giant Stairway he (like me) was firing on all four cylinders. Careering down the at times near vertical stairs, relying heavily on the handrails for stability, and calling out “runners” at regular intervals, so as to avoid any 'tourist' collisions, was the highlight of my day. I was 'flying'! Before we knew it we'd descended 200m, and found ourselves right down under the canopy of the Leura Forest. By this time it was early afternoon, the hottest part of the day, so I was thankful to be sheltered from the sun by foliage and overhanging cliff faces. Climbing out of the Leura Forest (more stairs, glorious stairs) making my way towards Leura Cascades, Doug called out that he was going to fall-back; we wished each other well. The next five or so kilometers were fairly solitary competitor wise. However, I was far from lonely, frequently conversing with other track users, out for leisurely Saturday walks, picnics and dips in the numerous waterfalls. I was quite taken a back by the next competitor I stumbled upon, and I told her so. Gill was not moving at the swiftness she's renowned for over mountainous terrain. She waved me through, so I passed (into 3rd position), confident in the knowledge that she was still moving at a reasonable pace, and there was a Water Point only a couple of kilometers away. The Fairmount Water Point (69.4) provided my second highlight of the day. Pausing briefly to fill one of my spare flasks I was offered a hose-shower. My response; “Yes, please. Don't hold back”. Just what the doctor ordered; a refreshing, revitalising spray to counteract the balmy 26 degree conditions. At some point in every event I have a chat with my 'mother' (beaten by Breast Cancer, aged 55 in 2005). It's typically a teary moment, I ask for the umpteenth time 'why'; why her?, why didn't she meet my husband? and son? why couldn't she have stuck around to see me running ultra marathons? Miraculously, I draw strength from our 'discussions'. Passing Wentworth Falls (75km) presented my UTA Mum Moment. Perhaps triggered by the fact that I'd visit the falls just two days earlier with my boys. Climbing out of the Wentworth Falls, feeling somewhat rejuvenated, I turned a corner, and there, just up in front was a female, walking. Surely, I hadn't caught up with position #2? To my surprise, I had! Throwing Amy some words of encouragement, I focused on my form and moved as efficiently as possible up the slight incline towards Check-point 5 – Queen Victoria Hospital (78.4km). The night we'd arrived at the Blue Mountains, I'd actually run these few kilometers, just shy of CP5, as a post-flight shake-out. This proved to be unexpectedly beneficial; being able to visualise the exact distance and terrain I needed to cover in order to reconnect with my support crew one last time, did wonders for my mental strength. It was along this section that I started passing the tail-end of the UTA50 runners (walkers). Approx. 7 hours into their journey and only half-way through – I totally respect their stickability. Almost everyone that I passed through that last 20km leg shouted encouragement (and visa versa); energizing stuff! Coasting down the tarseal road towards CP5, I spotted Todd over to the left, behind the crew barrier. He was in the exact position, we'd selected during our recce a few days earlier – top marks Todd! I quite literally throw him my sunglasses and two empty flasks, grabbed the two pre-filled flasks, and exchanged my light-weight head-lamp (that I'd been carry all day to meet mandatory requirements) for my heavier, more powerful Ay Up head-lamp. There was still close to two hours worth of sunlight left. However, I was fairly certain I'd be thankful for my 'possum-hunting' lamp in the final few kilometers of the race. Leaving CP5, almost as quickly as I'd entered (slotting pre-filled flasks into my vest isn't the easiest – requiring reduced speed and a fair bit of swearing (sincere apologies to those around me! )), I received the loudest, most enthusiastic encouragement of the day. Propelled on by the cheering crowd, I thought to myself, maybe, just maybe, I might be able to make up the 15mins Beth had on me. I shot off, over a small rise, before commencing the long, reasonably steep drop (approx. 650m over <10km) to our lowest point of the day, Jamison Creek. At one stage I thought I'd stumbled across my coach – surely not?! Scotty should be at least 1.5hrs ahead of me by now. Turns out I wasn't going totally bonkers with 80km plus under my belt – I'd caught up to Scotty's uncle, another Kiwi, Shane Thrower (their back profiles are hauntingly similar). It was invigorating to connect with a 'familiar' soul so late in the piece. In hindsight, I ran down from Kedumba Pass slightly too conservatively. At the time, I was conscious of safeguarding my quads for the final 12km or so climb / 750m elevation, up to the finish-line. Turns out I had plenty left at the end, so next time round I'll be throwing myself a bit more line down here. As I steamed into a dip that housed our final Aid Station (91.2km), one of the volunteers quickly grabbed my attention. Instantly, I accepted her offer of assistance (with 9km of ascent still to go, extra water might just be useful), I flung her an empty flask. For a split second I considered joining those that had opted for a leisurely pit-stop. Notably, this was the only time all day (11.5hrs) that I glanced in the direction of a check-point 'offering'. Yet, even now, not even for a split second, did I consider consuming anything aside from Tailwind. Just as the branding claims; it was all I needed, all day. Really! Additionally, I'm going to throw some credit Tailwind's way for my abnormally balanced day. I didn't experience extreme highs and lows, like I had in previous races. And I put this down to three main factors; a more appropriate, complete source of fuel, more targeted training (thanks coach), and a few more months of Fascial Stretch Therapy (with Back To It) under my belt. Whatever the reasons, I very much hope I can replicate the state of balance in my upcoming races. Taking back my re-filled (water) flask, I thanked the volunteer for going the extra mile, and was quickly on my way. Around half-way to the top, and approx. 5km from the finish-line I found myself back under the somewhat palliative canopy of Leura Forest. The trails became more horizontal, so I turned on my Ay Up, and joyously switched back into running mode (I'd hiked perhaps a few too many of the inclines out of Jamison Creek). I knew I wasn't far from the base of the formidable Furber Steps, so I utilised every possible opportunity to run (as fast as I could in the dark, dodging UTA50 runners, and with 95km or so in my legs). It was along this stretch that I came across my fourth Kiwi for the day, Anthony Hancy. He was wavering in the dark with his failing head-lamp. I suggested that he tuck in behind me, which he did. The Furber Steps certainly lived up to their reputation. Switching between hands-on-knees, hand-rail-haul, even hands-on-stairs, I simply dug in and climbed. Then almost as it had begun, in the dark, some 11 and a half hours earlier, I heard the enduring party-like crowd. I popped up on top, sprinted up the spectator-lined finishing-chute, under the monumental UTA arch, and across the finish-line. This time round it was straight into welcoming smiles, congratulatory hugs, and a wall of photographers and videographers. I hadn't managed to catch Beth, yet I'd steadied the gap, finishing 17 minutes behind the now four time champion of the UTA. Beth and I have raced on a number of occasions now; I continue to be in owe of her consistently, outstanding performances. Contrary to my initial speculation, I LOVED my day out at what's grown to be one of Australia's most challenging and prestigious ultra trail running events. I hadn't won, yet the Australian trails had won me over. In the future, if I'm ever in doubt, I'll be reserving judgement until I've seen / experienced, with my own eyes. Thanks to Icebug NZ, CEP NZ, Further Faster NZ, Tailwind Nutrition NZ , ENDUROBeet and Back To It, for backing me. 2016 is really heating up!